BRONX, NY., June 20, 2016 - HandBid, the premier silent auction mobile bidding and fundraising technology company for non-profits, has partnered up with the Hank’s Yanks Baseball Foundation to maximize fundraising revenue at the Second Annual Hank’s Yanks Celebrity Golf Classic, Thursday, June 23, 2016 at the famed Trump Golf Links at Ferry Point, NY. Scheduled to appear at the Hank’s Yanks Celebrity Golf Classic is: Carlos Beltran, CC Sabathia, Bucky Dent, Tino Martinez, David Cone, Chazz Palminteri and Danny Aiello, to name just a few. The proceeds from Hank’s Yanks Golf Classic fundraising efforts will benefit the Hank’s Yanks Baseball Foundation. 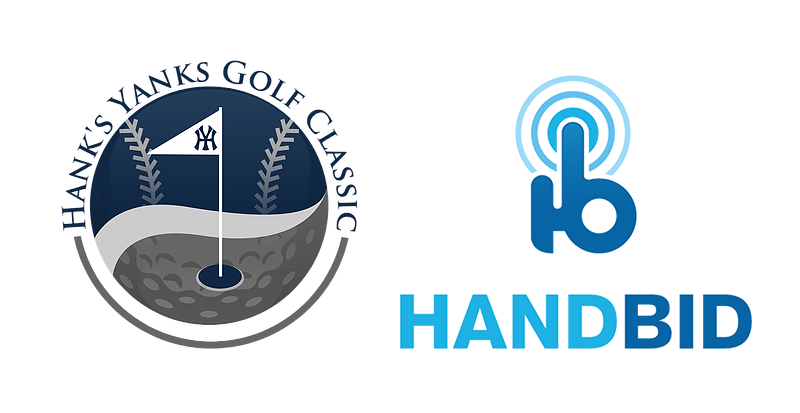 “We are excited to team with HandBid to provide our Hank’s Yanks Celebrity Golf Classic participants and New York Yankees fans throughout the country the opportunity to bid, via their smartphone, iPad and website, on some great signed memorabilia items and experiences that has been graciously donated to our Foundation,” said Mike “Red” Walsh, Hanks Yank’s Celebrity Golf Classic Executive Director. Handbid's mission is to provide non-profit organizations a native mobile silent auction app solution that improves bidder engagement with less effort, and superior results. Bidders and auction managers both love Handbid for its ease of use, beautiful interface, game-like experience and streamlined processes. Registration, bidding, checkout. Payments are all automated in Handbid, reducing lines and stress. In addition, both bidders and auction managers have a real-time view into bids and auction revenue. Auction managers can communicate with all bidders directly by phones to invite them to new auctions and give them important updates. In the end, organizations that use Handbid have a sense of control over their auction that they have never had before. Interested in learning more about Handbid? Hank’s Yanks gives kids from all walks of life the chance to play baseball. Funds raised from the tournament will support the baseball activities of the teams as well as the community outreach work of the athletes. Not only do the Hank’s Yanks players play a high level of travel baseball, they also perform both individual and community service throughout the year. Hank’s Yanks was formed back in 2010 by Hank Steinbrenner with the intention of bringing in kids from tough areas and keeping them on the right track in life by playing America’s pastime..